Down-home, Canadian hospitality are the hallmarks of Lower North Thompson. 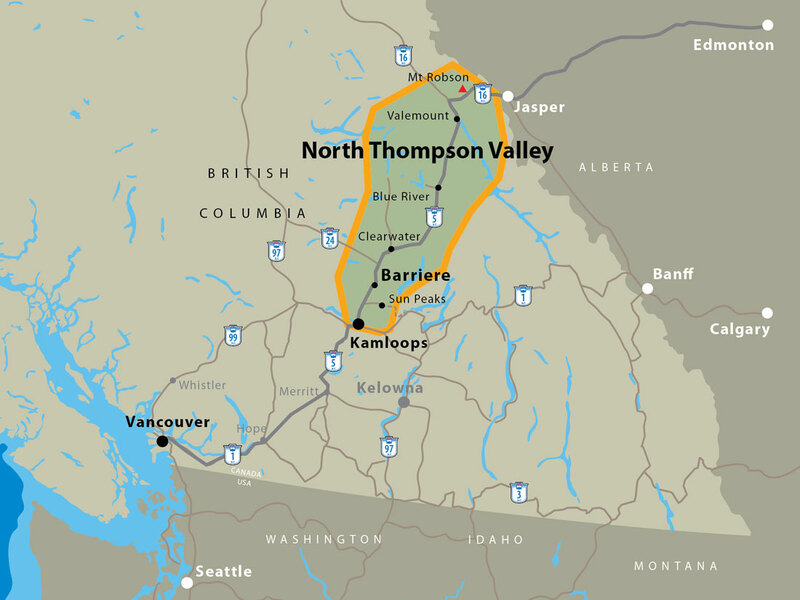 Set along the shore of the North Thompson River, 20 minutes from the confluence of the North Thompson and South Thompson Rivers sits the quiet hamlet of Barriere. 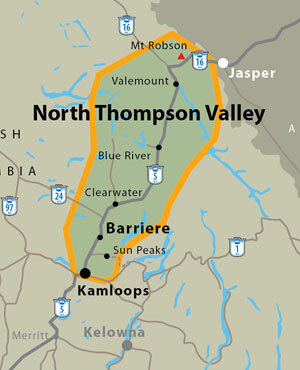 Take the Yellowhead Highway 5 and follow the North Thompson River some 66 km (41 mi) north of Kamloops. The charred and rounded slopes of the Monashee Mountains gently give way to waving meadows of alfalfa. The landscape makes it easy to believe you’ve gone back to the old western days of riding high in the saddle. Western roots run deep here. This is the home of the Jandana Ranch and the North Thompson Fall Fair and Rodeo. Visit Barriere the first weekend of September and you’ll have the chance to experience cowboy culture up close. Bring the entire family along to the North Thompson Fall Fair and Rodeo. Come and celebrate the best of this rural Canadian lifestyle. There’s livestock and rodeo competitions. Don’t forget the fair food and community dances! Detour from the highway and explore the trails and lakes surrounding Barriere. The charred remains of a once great forest are slowly green up. Marvel at how Mother Nature has regenerated the land after the McLure fire of 2003. Now you can venture into that same forest, once a wasteland. Hike numerous kilometres of trails that lead to views that can only be called inspired. Feast your eyes on rounded mountaintops, fields of avalanche lily, and azure blue lakes fed by underground springs. Bring your fishing gear along to angle or fly fish for famous Kamloops Trout. We have plenty of places for you to go. There’s fly-in fishing camps and nearby Johnson Lake Resort. This is where families have made warm summer memories for over 60 years. Take an educational tour at the Dunn Creek Fish Hatchery where the Simpcw First Nations conserve and maintain the local Coho population. Bring your GPS and a sense of adventure. Let geocache clues guide you to hidden treasures. There are several stashes just off the beaten path, maybe you’ll find them all! Veer off the highway at the monument to the McLure Wildfire for a self-guided interpretive tour dedicated to all who helped battle the blaze and rebuild the community. When the snow flies, add some layers and head outside. The Barriere area of the Lower North Thompson is well known for an abundance of ways to explore the great outdoors in the colder months. Snowshoeing and cross-country skiing are great ways to connect with nature. The Barriere Lake Ski Trails at Barriere Forks Regional Park have trails that are sure to entice you to stay outside, just a little longer. Located on the Barriere River, the park has easy access, plenty of parking and a warming hut. Snowmobiling is a popular past time here in the winter months. There are several resorts that are open for ice fishing that also have access to some great snowmobile trails. Check with them for availability and the conditions of the forest service roads and back-roads. You can also contact the Kamloops Snowmobile Association which has great information on trails in the Lower North Thompson area. However you choose to explore Barriere in the winter, our hospitality is sure to keep you warm! Hook, line and sinker, catch your best fish yet at one of our many resorts, including Johnson Lake Resort. Discover your new favourite fishing hole at one of over 100 lakes and area. For something more remote, try Fly-in Fishing Camps. All aboard the Rocky Mountaineer for tours that run through North Thompson Valley on their way to and from the Rockies. There are federal, provincial and private campsites all throughout the North Thompson Valley that provide every level of convenience from roughing it to full on luxury. 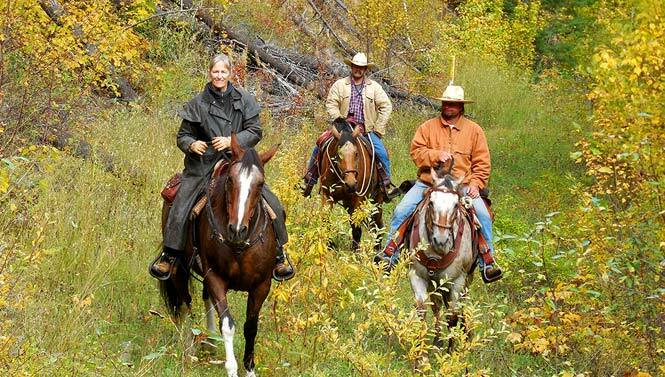 Outdoor enthusiast will love the range of activities from hiking the Hoodoos, horseback riding and even dog sledding.